You get a duke! And you get a duke! Everybody gets a duke! After reading the horribly grim Out, I need something lighter and sweeter to wash away the depressing aftertaste. A romance would work, I thought! 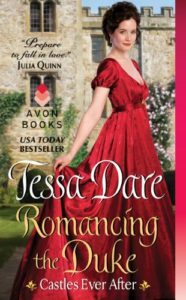 So I picked up Romancing the Duke from the library and settled in with it. Unfortunately, although I liked it better than Out, the content practically gave me whiplash. I found parts of it too cheesy and it gave me a serious case of vicarious embarrassment. Izzy is a spinster with a book series doppelganger. Her father published the Isolde Ophelia Goodnight tales, full of adventure and romance. Izzy’s life hasn’t lived up to the hype, especially not since her father died and she found herself practically penniless. When she inherits a run-down castle out of the blue, she can’t believe her good fortune. The only problem is that the castle also houses a grumpy, antisocial duke who happens to think the castle belongs to him. There were some bright points in the story of course otherwise I wouldn’t have granted it 3 stars, but I just couldn’t stomach some of the far-fetched events. Too many public declarations and fangirls/fanboys essentially cosplaying the famous stories named after Izzy. If you have a high tolerance for suspension of disbelief or embarrassing public confessions, you might do better with this one than I did. Share the post "You get a duke! And you get a duke! Everybody gets a duke!"